Up for bid Is 2015 Panini Contenders Bobby Portis Rookie Auto Arkansas All cards pictured! Feel free to message me with any questions or concerns. Will combine shipping thank you and good luck! CARD IS IN NM-MINT CONDITION. 🔥2015-16 REPLAY BOBBY PORTIS RC#/49 & 2018-19 Prizm Blue #/199 & Green Refractor Chicago BULLS 🔥 All (3) Cards are Shown. 2015-16 Contenders Bobby Portis Rookie /15. Condition is Like New. Shipped with USPS First Class Package. 2017-18 PANINI DONRUSS NBA - STARS, RATED ROOKIES RC'S - WHO DO YOU NEED!! 2016-17 PANINI DONRUSS NBA BASKETBALL - STARS, ROOKIE RC'S - WHO DO YOU NEED!!!! 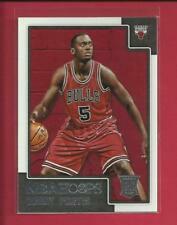 (3x) Bobby Portis 2015-16 Prizm Rookie Silver RC Bulls Bgs Psa Ready? ?